This is the old Allied Irish Bank building in Schull, West Cork. It is a dignified building, with an interesting history. It is built of Cornish ashlar limestone that had been imported to build a church on Clear Island. When the church was demolished in the 1930s the stone was brought to Schull and used to build the bank. It ceased to function as a bank some years ago. The building occupies a prominent position at the top of the village, visible from the whole of the high street. Panoramic views across the village to the harbour can be seen from its upper windows. It is listed on the Irish National Inventory of Architectural heritage. 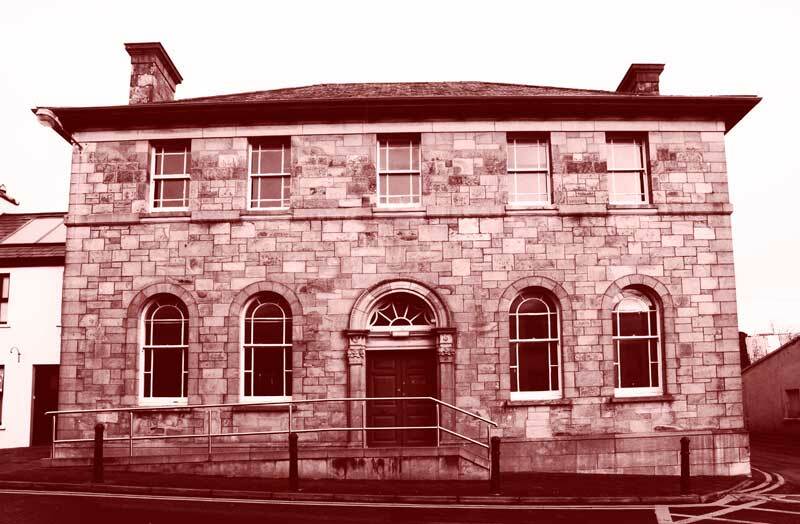 There are plans to turn this sturdy, handsome building into a new Film Centre for Schull. This venture stems from the annual Fastnet Short Film Festival, about to celebrate its 10th birthday in Schull in May this year.The plans for the building include incorporating a cinema, workshops, a festival box office, and accommodation for the film festival. In the above image I have removed some of the ugly cabling and an off-centre flagpole with which the AIB had disfigured this distinguished frontage. Exhibition prints of this and all other photographs on this site are available size A2 on Permajet Distinction Fine Art paper 325gsm price €100 including packing and posrtage to all parts of the world. Send email here with title of image and I will invoice you via PayPal (you do not need a PayPal account, you can pay with major credit/debit cards).